Barbara Licht, Ph.D., Mark Licht, Ph.D., Kathy Harper, D.V.M, Ph.D., and Shili Lin, Ph.D. The purpose of this article is to review what is currently known about the mode of inheritance for canine idiopathic epilepsy. As explained elsewhere in this web site, there are many causes of seizures in dogs (and humans) besides genetic epilepsy. These include, but are not limited to, head injuries, exposure to toxins, infectious diseases affecting the central nervous system, metabolic disorders, tumors, and more. Dogs should only be considered to have idiopathic epilepsy after these other causes of seizures have been ruled out by a thorough diagnostic work-up. Before we review what is currently known about the inheritance of idiopathic epilepsy, we would like to refer interested readers to Malcolm Willis's book, Genetics of the Dog, 1989 (pages 180-187). Although this book was published 10 years ago, the section on epilepsy in this book still provides a uniquely thoughtful commentary. The studies that have been published since then are consistent with Willis's conclusions. In discussing the inheritance of idiopathic epilepsy, the first question that must be addressed is whether there is scientific evidence that idiopathic epilepsy is inherited. The answer to this question is "yes." 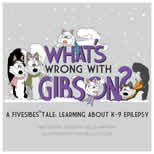 There appear to be at least 25 breeds of dogs that show a significantly higher than average rate of idiopathic epilepsy. While suggestive, this by itself does not constitute strong scientific evidence that idiopathic epilepsy is inherited. However, in addition to these statistics, a number of researchers have conducted pedigree analyses on specific breeds; and these analyses have found strong evidence that idiopathic epilepsy is inherited across generations. A partial list of the breeds that show at least some evidence of a genetic predisposition to idiopathic epilepsy include: Beagles, Belgian Tervurens, Boxers, Cocker Spaniels, Collies, Dachshunds, Dalmatians, German Shepherds, Golden Retrievers, Irish Setters, Irish Wolfhounds, Keeshonden, Labrador Retrievers, Pointers, Poodles (all varieties), Saint Bernards, Schnauzers (miniature and standard), Siberian Huskies, Vizslas, Welsh Springer Spaniels, and Wire Fox Terriers. Several breeds currently are being studied by different researchers (including our own group) to try to determine the specific mode of inheritance for idiopathic epilepsy (as well as to actually identify genetic markers that are linked to the genes that cause epilepsy). At the time of this writing (February, 1999), however, no one has found any conclusive results. In addition, the mode of inheritance and/or the specific genes involved are likely to be different for different breeds. Thus, even when researchers make important discoveries for one breed, other breeds will need to be investigated separately to determine if the same conclusions apply. For readers who are not familiar with the term "mode of inheritance," we will try to clarify. The mode of inheritance refers to whether the disorder is a simple recessive trait, a simple dominant trait, or a complex trait. Traits that are "simple" are carried by a single gene, while traits that are complex involve more than one gene. With complex genetic traits, the different genes can combine or interact with each other, and the genes can also interact with the dog's environment. Of course, simple genetic traits are easier to study. The term "recessive" means that a dog will only have the disorder if the defective gene is passed down by both of the parents. Thus, if only one parent passes down the defective gene, the offspring will not be affected with the disorder, although they can be "carriers" and later pass down their one defective gene to their own offspring. The term "dominant" means that the dog can have the disorder even if only one of the parents passes down the defective gene. As indicated, there are several researchers who currently are investigating the genetic basis of canine idiopathic epilepsy. If you own a dog with idiopathic epilepsy, or one of your dogs has produced offspring with epilepsy, please contact your breed's parent club to find out if any researchers are investigating your breed. If your breed's parent club is not sponsoring any research like this, encourage them to do so. This article was written by the Poodle Epilepsy Project at Florida State University. This Project is supported jointly by the Poodle Club of America Foundation Inc. and the American Kennel Club Canine Health Foundation. This project also has received donations from The Dalmatian Club of America Foundation, The Ralston Purina Company, Panhandle Pet Supply, and private individuals. The contents of this article are solely the responsibility of the authors and do not necessarily represent the views of the financial sponsors.